Vi gjengir her i sin helhet en melding fra Reuters som er sendt ut tidligere i dag. For bakgrunn henviser vi til vår omtale fra 20.februar samt ytterligere presseomtale i inn- og utland. Dr. Pachauri skulle egentlig ha trukket seg i oktober 2015, men klimapanelet får nå bedre tid enn forutsatt til å finne seg en ny leder til å administrere sine politiske prosesser. (Reuters) – Rajendra Pachauri stepped down as chair of the U.N. panel of climate scientists on Tuesday after allegations of sexual harassment, which he has denied. Pachauri, chairman of the Intergovernmental Panel on Climate Change (IPCC) since 2002, pulled out of an IPCC meeting in Kenya this week after the Delhi police started an investigation into a sexual harassment complaint against him. 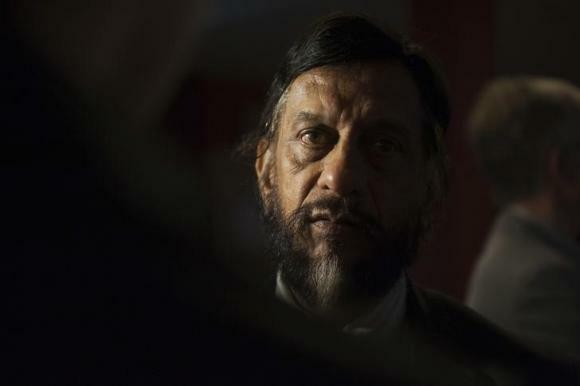 Pachauri has denied the allegations, according to a local court order. Pachauri, who has been chair of the IPCC since 2002 and whose term had been due to end in October 2015, has also suffered cardiac problems. In a letter to U.N. Secretary-General Ban Ki-moon, Pachauri said that his inability to travel to Kenya showed he may be unable to ensure the “strong leadership and dedication of time and full attention by the chair” needed by the panel. He collected the Nobel Peace Prize on behalf of the IPCC in 2007. Findings by the IPCC about global warming are the basis for action by almost 200 governments which have agreed to work out a deal in December 2015 to combat climate change. Brevet som Pachauri har sendt FN ved Ban Ki-moon i forbindelse med sin umiddelbare avgang kan du finne her. I påvente av valg på ny leder er Ismail El Gizouli fra Sudan innsatt som midlertidig IPCC-leder. Du kan lese om hans bakgrunn her. 24. februar 2015 in Klimapanelet, Klimapolitikk.